This week sees the Labour-led government release the Half Year Economic and Fiscal Update (HYEFU - pronounced hi-foo) and also reveal what will amount to a mini-Budget. Though given the scale of the funding shifts required to accommodate the policies agreed to in the coalition and confidence and supply documents, it's not likely to be very mini at all. Cabinet meets from around 10am through to about 1pm. Prime Minister Jacinda Ardern will host her post-Cabinet press conference around 4pm. Party caucuses meet, so watch for the gallery tweeting, and sometimes live streaming the caucus runs shortly before 10am. The House is sitting. There's Question Time at 2pm, followed by the rather uninspiring Order Paper which will likely see the government filibustering as they try to eek out time until Thursday. Statistics NZ releases the accommodation survey for October 2017. Given the strength of the tourism sector, this should show strong growth. The House is sitting, with this being a Members' Day I think. Question Time as per normal at 2pm. Statistics NZ releases the Food Price Index for November 2017 (effectively a measure of inflation for the price of food) and the Tourism Satellite Index for 2017. Star Wars: The Last Jedi is released at 12:01am. The Half Year Economic and Fiscal Update will be released by Treasury. From memory these come out sometime between 9am and 11am. I'm assuming that the mini-Budget will be revealed at the same time, rather than in the House. However, it is possible that the government will want an urgent debate on the mini-Budget. The House is sitting, though after Question Time it will be moving into urgency to consider legislation from the government's mini-Budget. The Press Gallery is having its Christmas Party. Statistics NZ releases the Agricultural production statistics for June 2017. It's possible that the House will be sitting under urgency on Friday, and even into Saturday, to push through legislation from the mini-Budget. Statistics NZ releases their Labour Force Projections through to 2068, and Transport Vehicle Registrations for November 2017. 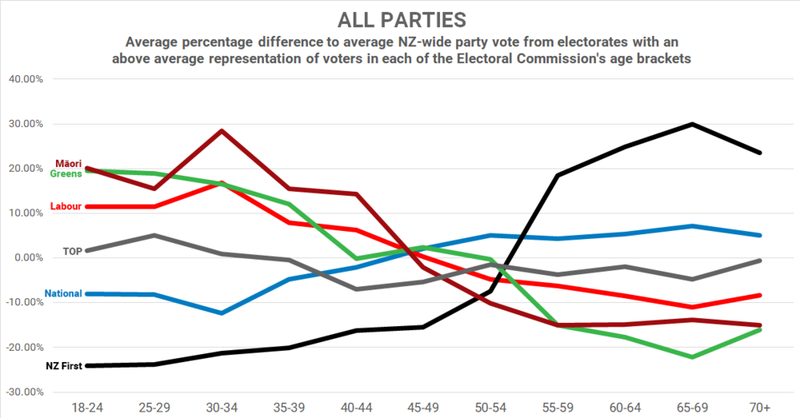 The most competitive market for votes in New Zealand is for those aged between 45-49, with National, Labour, the Greens, and the Māori Party all receiving, on average, similar shares of the party vote in electorates with above average shares of people in this age range. Spurred on by my other recent work looking at voter turnout by age segments and how representative that made electorates, and how those age segments were more, or less likely to vote (indicatively at least), I thought I'd take the plunge and look at each party individually across all the Electoral Commission's age brackets that they collect data on, to see if it revealed any other insights. What it's revealed is that while National and NZ First, and Labour, the Greens and the Māori Party might be poles apart in terms of their popularity with voters aged 18-34, such a big gap in voter preference based on age doesn't appear to manifest itself beyond 35 years old, starting to converge from its largest difference at 30-34-years-old, bar for the Green Party, Māori Party, and NZ First. As I said in the introduction, it's interesting how at the 45-49 mark, National, Labour, the Greens and the Māori Party all converge, with all getting more or less similar party votes from electorates with an above average representation from this age bracket as they did on average across all the General Electorates. Though I'd caution here that as this analysis excludes the Māori Electorates (due to their big youth skew and low deviation among the seven electorates), that the Māori Party figures here should be taken with a grain of salt. Also keep in mind that as you read through the following graphs, they do have different scales on the Y axis, so movements may be more pronounced in these than they are on the top comparitive graph. As you'll see later, with NZ First doing so well with voters aged 55 and over, National can, in the short term at least, reinforce their vote by targeting NZ First's supporters. Longer term however, National will need to find a way to both preserve their strength in covers aged 50 and over, as well as doing a better job of appealing to younger demographics too. Labour's graph in many ways is the mirror image of National's, albeit slightly more pronounced in its over and under-performance in the age brackets. The 30-34 age bracket is again interesting, as not only was this where National was most likely to perform worst, it's also where Labour performed best. Where National's deviation was relatively narrow, Labour's is much more pronounced, though it ranks in the middle of the six parties we're looking at in this. While Labour's support amongst youth voters is very strong, to offset the advantage that National gets from older voters, they would need much higher enrolment and turnout rates than they got even this election. In news that will shock no one, New Zealand First's support overwhelmingly comes from those aged 55 and over, but especially those aged 60 and over. Because of this, NZ First has the largest deviation of any of the six parties in this analysis. NZ First and Winston Peters focus heavily on courting this demographic, so it's no surprise that they rely so heavily on support from them. It also begs the question that once NZ First loses its trump card for reaching them - Winston Peters himself - how are they going to manage going forward, as nobody else in the party seems able to capture that audience in the same way that Winston Peters does. The Green Party have the second biggest deviation for their support after NZ First, and they're very much the opposite story to them too. Massive support across voters aged 39 and under, but this plummets to their average for those 40-44, before briefly rebounding for those aged 45-49, and not recovering beyond those aged 55 and over. Where the Green Party has an opportunity is to stop that leaching of support between people aged 35 years old and 44 years old, though in doing so they're likely to take voters from Labour. As I wrote earlier, it's important to take these figures for the Māori Party with a grain of salt. This analysis is based off General Electorate votes, and with the Māori Party support coming from the Māori Electorates, which are much more heavily skewed towards younger voters than the General Electorates are, isn't representative of what's going on. That being said, given the skew in Māori Electorates towards younger voters, it probably suggests that this graph might be even more weighted to young voters. If there is one thing the Māori Party could take from this, and my earlier work, is that there's an opportunity with a big cohort of young Māori voters for them to win over between now and 2020. The Opportunities Party is a bit of an interesting one in that because their vote was so heavily centralised around the Wellington region, it's likely the main influence on how this graph looks. TOP has done well with those aged between 18-29, and to a lesser extend those aged 30-34, and worst with those aged 40-49. National and TOP's support seems to switch at around age 39/40, while they bisect the rest of the parties between 49 and 54. Again, it's hard to read too much into these figures for TOP other than the fact that their deviation was the smallest among all parties. As I said in looking at the possible influence of age on party voting preferences, it's very tempting to claim that these graphs show the likelihood of different age brackets voting for different parties - e.g. those aged 18-24 are 8% less likely to vote for National than the average New Zealander, and they're 11% more likely to vote for Labour. I think this data hints at that possibility, but without exit polling - which is illegal in New Zealand - it's impossible to know this for sure. Where I think this data is very useful is using it to frame your thinking about where the parties position themselves in terms of their core support, and where they see the main battlegrounds are in terms of competing for votes from other parties. From around 30-years-old - where most of the parties graph lines start their journey towards converging on their national average - to the 50-54 bracket - where after that they diverge again, demonstrates I think that for the most part, the parties see voters within that 20 year age group - 30-years-old to 54-years-old - as the swing voters they need to target. NZ First is the only really noticeable exception to this rule, but that's largely because Winston Peters has progressively clawed out those on NZ Super as his target voter base. If you think generally about people in that 30 to 54 age range (and I'm talking very generally here) they're buying houses, getting married, having kids, they're likely to hit their career peak around between 40 to 49 (there's some US data around this, and sadly it has women's pay peaking at 40, and men's 49, highlighting again the gender pay gap). Retirement, while we're being constantly reminded about saving for it, is still a long way off, and the more immediate concerns are paying the mortgage or rent, affording school, doctors visits, dealing with health issues that become more and more likely to crop up, having a job, getting pay rises and getting ahead in life, and so on. Most have either finished up their travelling plans, or are about to, and are probably focused more on things like family or careers. If you keep all this in mind, it starts to give you a bit of a picture of how and why political parties position themselves the way they do. In many respects they have to ensure their base votes for them, but they also have to reach out to that big segment of 30-to-54-year-olds to win their votes too. You won't believe what happened in South Auckland! Two things appear to have gone badly wrong for New Zealand's centre-left bloc this election. We know the youthquake hasn't happened, but the other appears to be that Labour's traditional South Auckland strongholds have failed them badly. Not only did those electorates deliver well below Labour's average gain across the country, but National was actually able to increase their share of the party vote there too! Before you read any further you should note that these are based off the preliminary count, and don't include the 385,000 special and overseas votes yet to be counted. I'll try to another recalculation of these statistics once we have the final declared result, as I imagine there could be some shifting around in these rankings. Of the 71 electorate seats, National managed to increase its share of the party vote compared to 2014 in 12 of them. All 12 of those seats were Auckland seats too. As you can see from the above, where National has done surprising well across both South and West Auckland. In a campaign where issues like housing affordability, inequality, and health were meant to be top of mind for voters, and Labour touted their solutions to these problems, that they not only failed to gain traction in South and West Auckland, but allowed National to grow its share of the party vote there, is what stopped them from winning last night. Where National lost most ground is interesting too, with National being most punished in the urban centres and a few provincial cities too. There could be a couple of things going on here. The first, I suspect, is the Jacinda effect showing up with young, urban voters in the big centres going Labour's way. Mt Albert will definitely be the Jacinda effect at play given it's now her home turf, and Christchurch Central and the Port Hills could be to do with simmering issues over Christchurch's earthquake recovery. Interestingly, despite having lost badly in Mt Roskill in last year's by-election, National has performed well there. Which makes you wonder if they fielded a better candidate there whether they might have a better chance of winning the seat in the future. I've including National's performance in the Māori seats here for consistency with the following graphics, but the reality is that National doesn't collect many votes in these seats and is usually outpolled easily by New Zealand First. If I were Labour the first thing I'd be doing on Monday is sacking whoever was in charge of campaigning in Auckland, and probably Phil Twyford - Labour's overall campaign manager - too. While Labour grew its share of the party vote in all electorates, its failure in Auckland is little short of a disaster for them. To win an election in New Zealand you effectively have to win in Auckland, and South and West Auckland should have been areas Labour did better in. There's probably a few reasons why Labour failed in Auckland. The large Chinese and Indian ethnic communities would likely have voted National following Labour's various anti-immigration debacles over the past three years. It's notable that Jacinda Ardern, when presented with a chance to back away from these policies, hasn't done so, and Labour has paid the price. I'd also wager that Bill English's Catholic faith and his wife Mary's Samoan heritage has played a role here too. It would have allowed many Pacific Island communities across Auckland to identify with him more than Labour, and comes off the back of National having made a real push to these communities over the past two elections. The real stars for Labour though were the Māori electorates, which were not only the top five best performing, but took out seven of the top 11 spots. While Willie Jackson did nominally fill the role of Māori campaign chair, I'd wager that most of this growth had little to do with him, and more to do with a backlash against the Māori Party, Kelvin Davis' elevation to the deputy leadership, and Jacinda Ardern eating the Green's party vote across the country. Beltway sorts should have a nice chuckle that New Zealand First grew it's share of the party vote the most in Clutha-Southland. Other than that there's not much for Winston Peters to get excitged about here. Him being the MP for Northland clearly helped there, as did the selection and focus on Shane Jones in Whangarei. Other than that, it's pretty grim reading. Losing 2.78% points in Tauranga and Bay of Plenty is bad news given that this used to be Winston's stronghold. They also didn't fare particularly well across the country in general, growing their share of the party vote in only five electorates and getting badly hammered in the Māori electorates which were their six worse performing overall. With all this in mind, it's clear that once Winston Peters is gone, New Zealand First is gone. Winston and his party are utterly incapable of succession planning, and there's clearly nobody in the caucus who would remotely be able to pick up the mantle once Winston is gone. So enjoy Winston's theatrics while they last. There was no good news for the Green Party across the country, only terrible news, bad news, and not quite as bad news. The really damning stuff is how poorly the Greens did in Wellington Central where, in 2014, they got the second highest share of the party vote. It appears that the Greens urban liberal base have deserted the party in droves to go with Labour. Rather than a youthquake, we've had a youth exodus from the Greens to Labour. Where the Green Party can take heart I think is their performance across South and East Auckland where they stemmed the bleeding, in part helped by Labour's seeming inability to run a successful campaign north of the Bombays. I have a fleeting suspicion that some of their relative success here will also be down to Chlöe Swarbrick, who's likely converted much of the support and subsequent media coverage she received in her 2016 Auckland mayoralty run into support for the Greens. Hopefully the Greens realise what a huge asset Chlöe is for their future, as they'll need her to turn things around at the next election. In terms of the Māori seats the Greens have been hit by the swing to Labour in them, though not to the extent that New Zealand First was hit. The final thing I wanted to throw in here was looking at the biggest swings around the country. To measure this I took the combined shifts in Labour and the Greens share of party votes, and looked at the gap to what National had lost (and vice-versa for any swings to the right). Only four seats recorded a net swing to the right - again all in South and West Auckland! I suspect that on special votes Manurewa might drop off this list those as 0.11% points would be well within the 0.3% point drop I've predicted for National's party vote share from advance voting to final results. Even if Manurewa drops out, this still represents a massive failure for Labour in Auckland, and it's an issue they have to sort out if they're to beat National. As per the other results, the seats where Labour did well and National did poorly largely figure here. The Māori electorates would have had larger net swings that I've recorded above due to my not including the Māori Party in these calculations. What's crucial to remember though is while 67 electorates have experienced a net shift to the left, Labour and the Greens are still 4.3% points short of National, meaning that you can't necessarily claim a mood for change exists within the country, as more people voted for the status quo than for the alternative centre-left bloc. I don't think you can justify lumping New Zealand First's party vote in with a mood for change, as it's more just a "mood to be listened to" by those who vote for him.